National Poetry Month ended this year in BC with an exhilarating event. The third annual Cascadia Poetry Festival, held in Nanaimo April 30–May 3 (http://cascadiapoetryfestival.org/2015-nanaimo), was an opportunity for poets from throughout the Pacific Northwest and northern BC to come together and—for a few days at least—erase the social and political borders they normally live within. 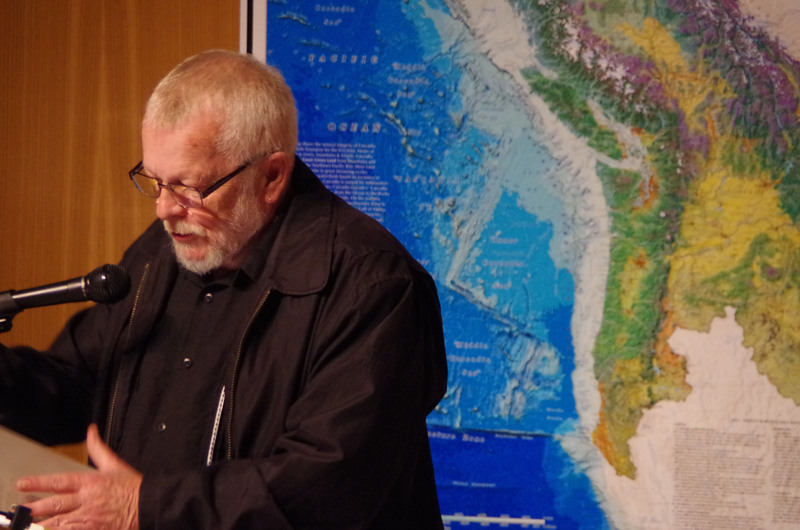 Dr. David McCloskey, an Emeritus Professor of Sociology and Anthropology at Seattle University, kicked off the Friday morning program with the unveiling of his new Cascadia bio-region map. McCloskey has spent 5,000 hours creating the Cascadia map, which not only erases the political boundaries of the Pacific Northwest, it provides a detailed geographical, tectonic and hydrological image of the region we call home. This diverse ecological region is bounded by the Rockies and the Continental Divide on the east, the Pacific Ocean and Cascadia Subduction Zone on the west, California’s Mount Shasta on the south and Alaska’s Mount Logan on the north. Appropriately, Cascadia means “land of falling waters,” and includes several of western North America’s major river systems—the Fraser, the Columbia, the Snake. But what does this have to do with poetry? McCloskey pointed out that in today’s world we tend to have an idea of the local and the global, but not what lies in between—the bio-region we inhabit. “How is it we don’t know the place of our own home?” he asked. Our sense of place in the landscape is often best articulated by our storytellers and poets. 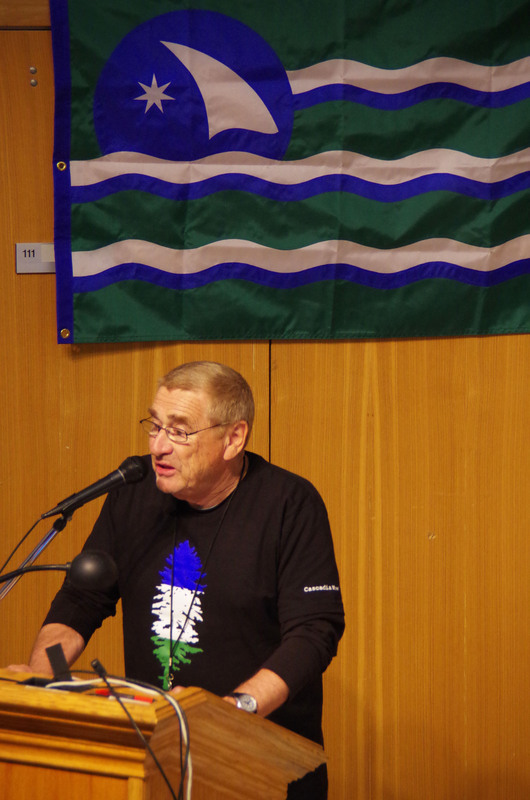 McCloskey asserts that a new narrative of Cascadia needs to be born. Aside from its value as a finely grained geographical tool showing details of every ecological sub-region, the Cascadia map is a springboard for the writer’s imagination. It’s a call to explore its many layers—our neighbourhoods, communities, watersheds, bio-region and all the way outward in consciousness to our continental rim and the ecosphere itself. “We wanted help imagining the place,” said McCloskey. “The poets were a great help. We need all the voices, just like the trees each sing in their own way. 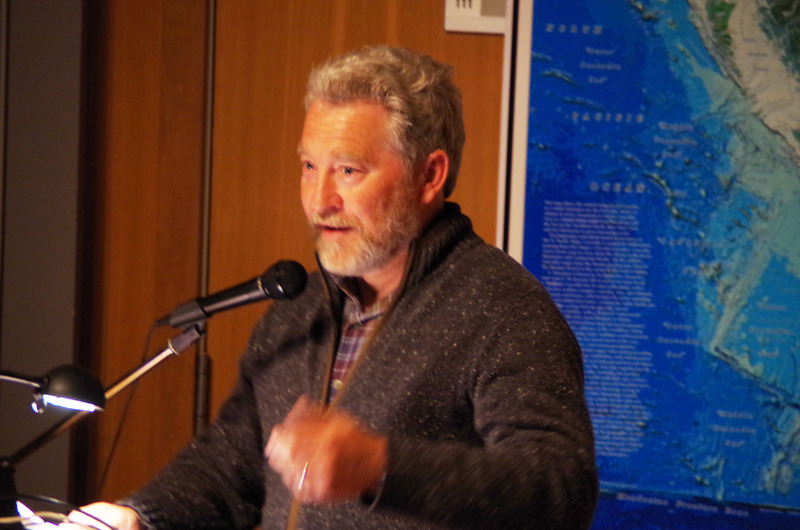 The poetic imagination can translate it and go into the heart of it.” To that end, McCloskey urged poets to abandon abstraction in their verse in favour of poetry that connects readers with Cascadia’s landscape in a more direct, accessible fashion. “We need to get beyond ourselves,” he said. With the global climate change crisis, it’s all hands on deck—we need to widen our view as poets from the self to the universal. This is something I’ve been saying for more than a decade. In the Introduction to my 2005 collection The Charlatans of Paradise, I wrote: “In the trajectory toward the universal, contemplation of the self is only going halfway.” I decried postmodern poetry’s tendency to create “word snapshots that are pretty, clever, but ultimately meaningless.” Finally, it would appear that postmodernism’s death grip on poetry is relaxing as we realize it actually fosters separation and disconnection from the world. What we need right now is writing that connects people to the landscape, the bio-region we inhabit. It’s interesting to note in this context the impact that ‘slam’ poetry has had on mainstream poetry. I liken it to the effect of punk music on the popular music of the late 1970s—although much of punk wasn’t particularly good or lasting work, it forced the music industry to snap out of its disco-induced trance and revitalize itself. Slam poetry often lacks the editing rigour of literary poetry but at least it has reintroduced performance and politics to the poem. In other words, it has placed us squarely where we are in history—beyond our own heads or literary conceits—just as narrative poets have done since Homer. This theme was echoed somewhat in the Cascadia Poetry Festival panel discussion Make It True, riffing on the launch of the 100 Innovative Cascadia Poets Anthology of that title. On the panel—consisting of festival founder Paul Nelson, Barry McKinnon and George Stanley and moderated by Nadine Maestas, Nelson noted that too much current poetry suffers from “the tyranny of irony.” While it’s fine to tear down and expose society, there’s a need to build up as well. To me the firm impression was also that the time for experimentalism in language has run its course. Now is the time for intimacy and connection. What panelists called “the corruption of our biosphere” is in fact a call to action, as Berry suggests. McKinnon cited avant-garde composer Philip Glass, who, when asked: What is music? answered: “Music is a place.” This fit nicely with McCloskey’s call to develop a wider consciousness of the Cascadia bio-region. Stanley asked a question I’ve been asking for decades now: “What does obscurity communicate?” Exactly. If the purpose of writing isn’t to communicate, why bother? Still, it was interesting to watch professors McKinnon and Stanley dance when asked by an audience member: “What’s so wrong with bringing issues into poetry?” This touches the raw nerve in academia regarding political poetry, typically a taboo area for literary poets. Here again the slam poets have no such compunction. Nelson offered a useful clarification, pointing out that political poetry often suffers from a lack of craft: “If you remove the line breaks and it reads like bad prose, then it’s rhetoric, not poetry.” Thankfully there are plenty of examples of first-rate poets who have written political poems that meet the test of craft: Tom Wayman, Gary Geddes, Denise Levertov, Neruda, etc. In terms of craft, the panel agreed that one can’t simply revisit and rehash the poetics of the past—new forms are needed. 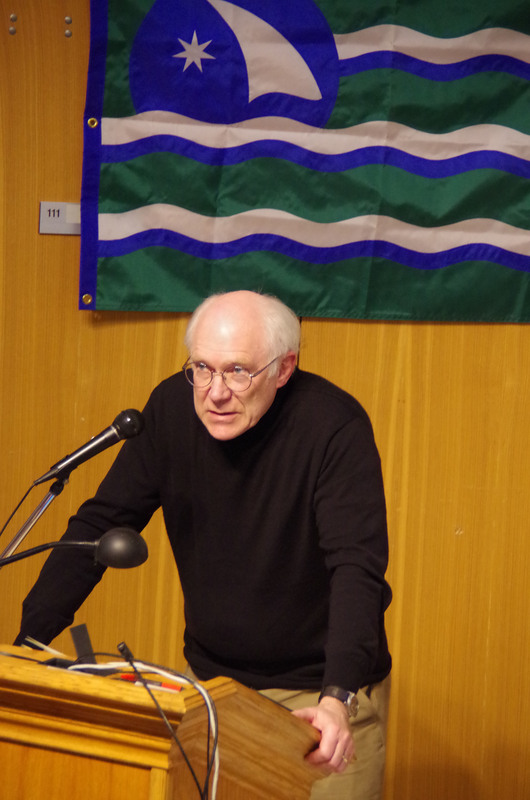 Nelson cited Levertov’s credo that “form is never more than an revelation of content.” The festival screening of the documentary The Line Has Shattered, about the 1963 Vancouver Poetry Conference, underscored the connection with history’s break from the classical poetic forms. Traditional meters were revived briefly with the New Formalism movement of the ’70s, but it never gained much traction. An exception to this rule would be Bruce Meyer’s excellent 2009 collection Mesopotamia (http://49thshelf.com/Books/M/Mesopotamia), which does an amazing job of creating dazzling originality within traditional forms. But few poets are capable of this feat; too often it descends into Hallmark greeting card rhyme. Meanwhile in poetry generally, the openness fostered by Creeley and the Black Mountain School as it intersected with BC’s TISH movement seemed to collapse into a largely impenetrable postmodernism. The potential of postmodernism failed, just as Hemingway’s obliteration of literary ornamentation in the novel has failed us by spawning legions of imitators writing mostly dead, flat prose. Nelson stressed that the organizing principle of the Make it True anthology was to be open on the question of form. The Living Room readings held at the Nanaimo Museum in the city’s beautiful heritage old town district were a chance for poets at all levels to read their work. Poets sat in a circle, each one reading a single poem, with occasionally enough time for a second poem. Attendance averaged between 35-55 at each circle. The diversity of voices from all over Cascadia was fascinating and covered poets from their teens to late retirement ages. Unfortunately I had to miss the slam event Saturday evening After Party due to staying with friends on Protection Island; the last ferry leaves Nanaimo Harbour at 10:10 pm. Though given how full my head was at the end of each day’s session, I’m not sure I’d have had the energy to ‘slam’ deep into the night anyway. 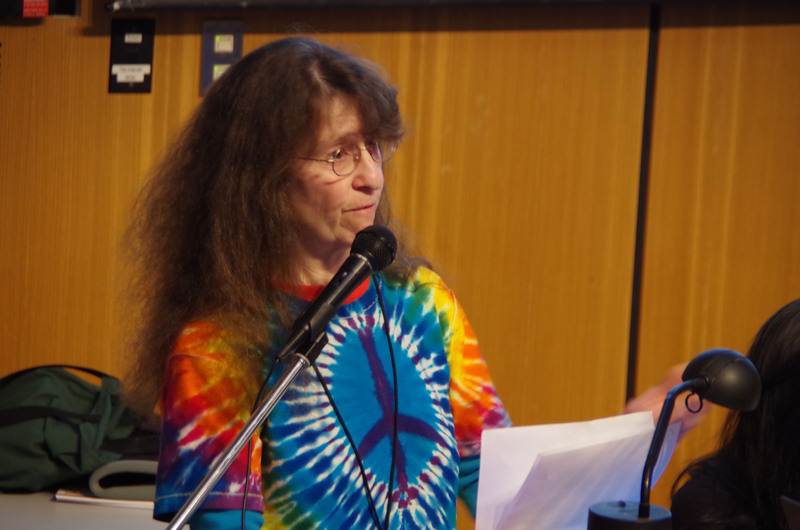 The keynote presentation on Saturday’s program, with poets Yvonne Blomer, Brenda Hillman, Amber Dawn, Susan Musgrave, Gary Gottfriedson and Harold Rhenisch was stunning. These poets proved that compelling public performance of poetry isn’t limited to slam poets; the evocative and technical excellence was glittering. Sam Hamill, founder of Poets Against the War, was a revelation. Despite frail health he performed gustily and the awareness dawned that here is a new modern master. Hamill set a record when he amassed 30,000 poems from 27,000 poets to be registered in the Congressional record in opposition to the Iraq War. 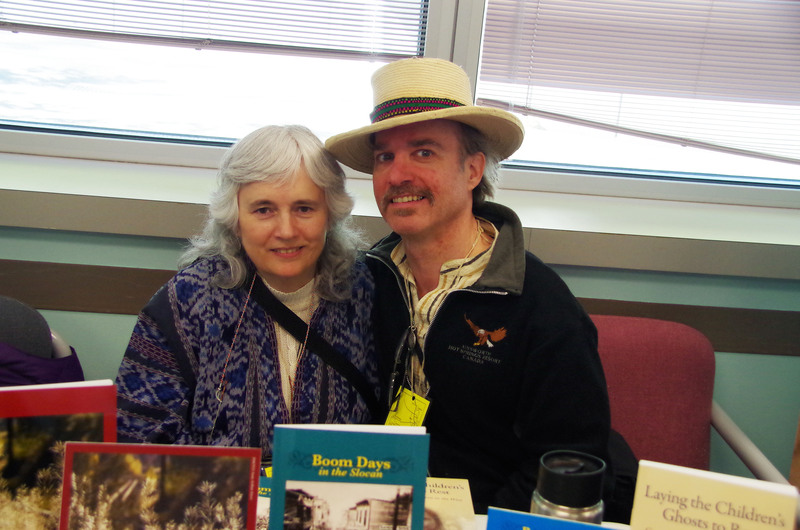 Along with Sandra Stephenson of John Abbott College Peace Studies in Montreal, I co-founded the Canadian branch of Poets Against War about ten years ago. Cascadia Poetry Festival organizers and volunteers are to be commended for an amazing job. There were a few glitches, as one expects at any event. The Book Fair schedule needs fine-tuning so that booksellers aren’t sitting staring at each other for hours on end waiting for participants to get out of sessions on all-too-brief breaks. And the Living Room Circle would have benefited by breaking up into smaller groups (where the hard-of-hearing like myself could hear more). But overall, it was an exhilarating, not-to-be-missed experience! I came home with a shelf-full of new poetry books, including Sam Hamill’s magnum opus, Habitation, a truly masterful collection of his work and a true voice of Cascadia. I urge you to pick up a copy: (http://www.losthorsepress.org/catalog/habitation/). And watch out for next year’s Cascadia Poetry Festival! 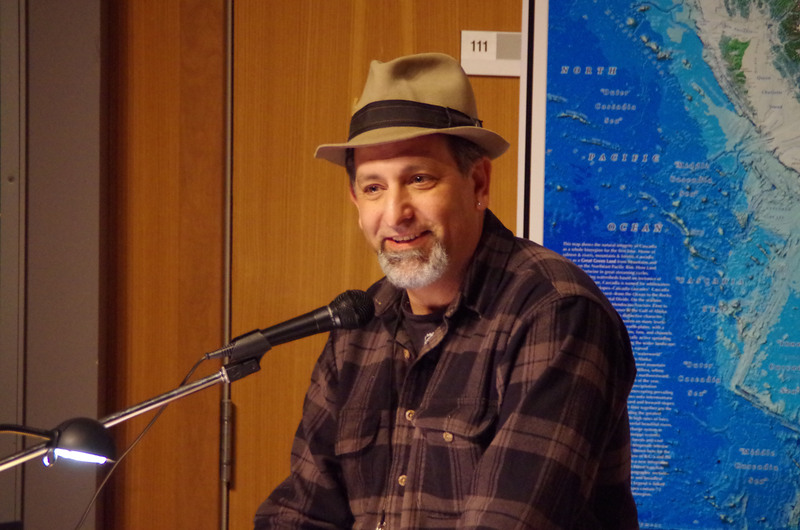 This entry was posted in Cascadia bio-region, Poetry and tagged activism, Cascadia Poetry Festival, civilization, creativity, environment, nature, poetics, poetry, writing. Bookmark the permalink. I know about the CIA story and it’s not as juicy as one would like to think, but institutional funding of the Iowa Writer’s Program (also CIA-linked) HAS limited the depth of the gesture of North American poetry in general. But if you read Projective Verse, the seminal essay by Charles Olson, you’ll see it is all about OPEN FORM, meaning the form is never more than a revelation of content. The form of each poem differs based on where the language (or other impulses larger than the poet) take it. I think when Olson described the process of writing projectively as a “use of speech at its least careless and least logical” he describes perfectly how the OPEN works and this does not mean just open to different forms. It means discovering the form of the poem in the act of writing it. A huge shift not fully understood even 65 years after Olson published the essay. If we are pre-occupied by getting our verse over to folks for whom poetry is advertisements, we’re in a no-win situation. Funny, but Sam Hamill is a projective poet, albeit on the right side of that spectrum, and yet his poetry is accessible, he communicates and he’s made a life understanding the tenets of open form. Paul: interesting points all and I thank you for them. I understand about open form, and have tended in my own poetry to proceed based on that idea of the form being revealed by the content. Oddly, sometimes that has led me back to quasi-traditional verse structures. However, I’m not a formalist, nor am I arguing for it. In rare cases like Bruce Meyer’s book he pulls it off brilliantly. Perhaps what is most galling to me is the notion of “language-centred” poetry, what could be considered the written equivalent of abstract expressionism in visual art. The idea of using language like a toy you take apart and put back together in a way that suits your fancy but ultimately strips it of meaning. The shotgun of paint on the canvas. I simply cannot see the point of this exercise, except as a private indulgence. As public art, it clutters up the airwaves and wastes our time if we can’t connect with it. I believe this is what the CIA understood. I enjoy subtlety and ambiguity as much as the next writer and work very hard to include it in my own poetry, so that, as you say, there are multiple levels at work. This as I see it is essentially the difference between genuine poetry and that which becomes mere Agit-Prop or greeting card verse. I still resonate with Aristotle’s dictum that the sign of mastery in poetry is the command of metaphor. And what is a metaphor if not something that works on multiple levels and rewards repeated readings? Yet surely there’s a way to still make such a poem communicate with the reader rather than leaving them utterly puzzled. I believe this is why poets for the most part until recently have NOT been the voices of their generations. I think once postmodernism took hold, that vacuum was ably filled by our popular songwriters: Dylan, Cohen (who is a poet), Springsteen, U2, etc. They had no compunction about speaking to the audience directly (and poetically) in their lyrics about issues that mattered to them. True, poetry is a different art than lyrics, but I think there’s a potential crossover principle here. And it may be why songwriters’ audiences are the public while poets’ audiences until recently have mostly been other poets. I say until recently because, despite my misgivings about Slam, I think it’s reviving poetry as a popular art in the public mind. Tom Wayman and I have discussed the issue of political poetry at length. If anyone has been an outsider in the Canadian poetry establishment, while still somehow managing to be quite successful, it’s him. Have a read of my earlier blog posts where I interviewed him. I do agree with you that without craft, political poetry becomes a kind of forgettable sloganeering. Incidentally Tom has a new essay coming out on postmodernism that challenges its orthodoxies. I end up in a positive place now, seeing the increasing popularity of poetry after decades of being mostly an academic product. I find this very hopeful, though I have no desire to see it simply become another consumer product either. It’s a fine line to walk. SAJ said: “Oddly, sometimes that [open form] has led me back to quasi-traditional verse structures. This is not odd, but echoes what Robert Duncan said about Composition by Field. One of the 5 main faculty members at the 1963 Vancouver Poetry Conference and a huge influence on the TISH poets, his words deserve a hearing to understand Cascadian poetry, especially as it went from the romantic era to the postmodern, skipping Modernism as George Bowering likes to joke. (No joke though. A lot of truth to it.) Is the work of TISH elitist and self-absorbed? I don’t think so. It is some of the most engaged poetry anywhere, getting deeply into place, history, indigenous culture, Zen and other topics. Duncan said that when you write with the page as a field, all the old forms and meters have a place in the poem. The field is open to all of it. That does not sound ivory-tower to me and Olson and postmodernism is a HUGE influence on him and he was cited on the panel by Barry McKinnon. I reviewed one of his recent books here: http://paulenelson.com/2013/10/31/a-little-history/ So, we’re agreed that much of what goes under the rubric of Language Poetry has little content where the rubber meets the road, let’s say. In large part it has been a wrong turn for North American Poetry, I’d agree with you. But to say all postmodernism is useless is something I’d disagree with vociferously. All abstractions and generalizations. Now it was Modernists (Pound) who talked about the need for “abstractions to be earned” or “go in fear of abstractions, and even before that, Blake, who warned about abstractions being the plea of the hypocrite, knave and scoundrel. Should we blame Modernism for its focus on the image? Or should we realize how insipid pop culture is? I think the culture has marginalized itself and not the poets to blame. I think it is a political act to reject the conventions of popular culture, but everyone has to do what feels right to them. If it is a large audience you crave, more power to you. My own practice is, as Sam Hamill calls it: “Poetry as wisdom teacher.” I may not get rich, but the quest is fulfilling. I am no academic. When a typical institution sees my resume, they can smell the “outsider” from a distance. I share your disdain for elitism, but I am not ready to dumb things down for an audience. I’d like to meet them in the middle somewhere and leave the poem open enough for the content/meaning to be somewhere between what I was thinking when I wrote it to what they bring to the act of listening or reading the poem. I suspect we’re not too far apart and I am grateful for the exchange. Paul: yes I think the gyre in this discussion is simultaneously widening and closing so we’re not at all far apart. I think it’s important that poets have these kinds of civil dialogues about craft and the direction of poetry as an art. I’m grateful to engage with someone who knows the difference between attacking an idea and attacking the person. Thank you. That is becoming rare in these days of what I call anti-social media. I did say I enjoy Magic Realism, which is considered an outgrowth of postmodernism, though I can’t say much postmodern poetry has stuck with me. If you eliminate all meaning from language you risk creating nihilism, something I think we agree we’ve all seen enough of the past while. If nothing means anything, why care about anything? That’s the ethical risk inherent in such an approach. (Not saying ALL postmodernism eliminates meaning.) Wendell Berry has been firm on the point that poets should use their voices responsibly. Bio-regionalism as defined in the introduction to Make It Real is clearly about values, about valuing the natural world that feeds us and keeps us alive, more than, say mega-corporations that feed off and destroy it. Values and meaning are linked. But in fairness your choice of U2 lyrics wasn’t the most apt. ‘Sunday Bloody Sunday’ was an early effort that made a clear statement about ‘The Troubles’ in Ireland, just to name one. Cohen’s lyrics to ‘The Future’ are incisive and even prophetic. Dylan came out of the gate with ‘Masters of War,’ which is as apt today as it was 45 years ago. Peter Gabriel wrote ‘Biko’ and exposed the brutalities of apartheid in South Africa to a world audience. I could go on… Though I certainly agree, much of the writing in pop music is pathetic. Contrast the audiences that Yevtushenko or Dylan Thomas could attract in their day – reading to hundreds or thousands at a time – with the audiences poets can expect today. I’m not a populist any more than I am an elitist, but a red flag goes up for me there. As you suggest, part of that has been the ‘dumbing down’ of culture since the ’50s, especially through TV. But it is interesting to me that if you ask the average person since the Baby Boomers to recall a pivotal lyric or poem in their lives it’s far more likely to be from a song than a poem. Whereas, our grandparents’ generation, it would have been a poem, hands down, and what’s more, they’d have recited it to you verbatim. What resonates changes from generation to generation but until the past half-century, it was most often the poets who’d be quoted, not the popular musicians. Again, this could just be the dumbing down factor. But I suggest poets themselves can’t completely escape responsibility if their work is so opaque you need a degree to penetrate it. And such abstraction often requires an academic industry to support it, just as a technical industry needs specially-trained experts to interpret and apply its products. These poets therefore shouldn’t be surprised if their main readers are other graduates of specialized literature programs and not the public at large. That places the writer ‘above’ the reader, an uncomfortable place for any reader to be from the start. In my view, the poet’s role is to be the ‘hollow bone,’ to allow the universe to sing through her, not about her. That doesn’t mean the poet can’t sing about the politics that are relevant, just that the goal should be to draw attention to the issue, not the writer. Not saying poets all need to become proselytizers, but often we do need to ‘speak truth to power,’ as Sam Hamill did so eloquently with Poets Against the War. It’s not the only role for poetry by any means, but it is an important one. “But it is interesting to me that if you ask the average person since the Baby Boomers to recall a pivotal lyric or poem in their lives it’s far more likely to be from a song than a poem” but it’s also likely to be a commercial jingle. From the Land of Sky Blue Waters, when you see Libby’s Libby’s Libby’s on the Label Label Label, you will like it , like it, like it on your table, table table…” So should we honor TV commercials too? Paul: Does obliqueness automatically equal depth? There are many ways to go deep in a poem: structurally, metaphorically, psychologically, philosophically…. Once again I return to the many layers that can peeled off a great metaphor, Aristotle’s dictum. I love that kind of depth. Yet still somehow the coruscating fireworks of language must be grounded at some point in the poem or the reader will get lost. There needs to be a common point of reference. And given what I’m hearing from the Slam poets I’m not sure I’d agree with you that poets who speak more plainly can’t be on the cutting edge. Not all of it is great poetry by any means but surely you could agree they’re pushing the envelope. I also clearly stated in an earlier post that I understand that song lyrics and poetry are different arts. Yet there are many potential points of crossover. Historically, music and poetry were one: only gradually did they diverge, as we know the two genres today. And I’m not sure musicians would appreciate having their lyricism lumped together with advertising jingles; your argument in this instance employs a non sequitur that goes far beyond what I was saying. As a poet I’d have been thrilled to write that last line; if that isn’t poetry I don’t know what is. Of course, Cockburn is one of those rarities in pop music: an artist whose skill as a lyricist is as finely-tuned as his compositional skills. I can easily see this in an anthology of 20th century poetry, along with the immortal line from Anthem: “There’s a crack in everything / that’s how the light gets in.” Mm, mm, mm! Sweet. In just a few lines the grit, decay and corruption of urban America is well captured. I would say that’s evidence of some poetic ability. I see poetics as elliptical in nature, not linear, as in the sciences, where we assume that as new discoveries are made and proven, we must discard the earlier ideas. The process of poetics seems far more cyclical to me. I don’t see that linear logic applies to any art, much less poetry, i.e. everything before postmodernism is now supposed to be passé. As your man Sam Hamill says, poetry is a big tent and no one has the last word. but this is the rare exception to the rule. Pop lyrics, in 98% of the time, are banal, cliché and abstract. My opinion. I do not log for the audiences that pop stars have. I like Carla Bley’s approach in which she has 50,000 fans around the world who love what she does. That’s a great model (I’d settle for 1,000) and I think she will outlast pop music even without the market forces of radio stations (what’s left of them) and the rest of it if not opposed to her work, surely not supportive. “Labor well the minute particulars, take care of the little ones. Intense fragments of spoken idiom best. — A. G.
Maximum information, minimum number of syllables. –– A. G.
Syntax condensed, sound is solid. — A. G.
Savor vowels, appreciate consonants. — A. G.
“the unspeakable visions of the individual — J. K.
“Contact” — A Magazine, Nathaniel West & W. C. Williams, Eds. “Subject is known by what she sees.” — A. G.
Others can measure their visions by what we see. –– A. G.
Candor ends paranoia. — A. G.
Tyger: “Humility is Beatness.” — Chogyam Trungpa, Rinpoche & A. G.
Lion: “Surprise Mind” — Chogyam Trungpa, Rinpoche & A. G.
My aim in poetry is to use it as a wisdom teacher, to use it as a transformational device and practice and I think the process is sped up when we can send back the hype that our culture gives Pop music (Pop ANYTHING.) That you get joy from it is not something I would want to deny or discourage you from. But I’ll take TISH, Olson, Duncan, Joanne Kyger, Nate Mackey, Brenda Hillman, Sam Hamill, Eileen Myles, José Kozer, Lorine Niedecker and many other poets over 99.9% of pop musicians and slam poets any day for my purposes. Paul. Poetry as wisdom teacher. Excellent. I love it. I certainly am not arguing for clichés, although abstractions may be in the eye of the beholder. Nor am I any friend of corporate culture. But if one measure of the success of a poem is a to imbue a sense of transcendence—over death, boredom, despair or whatever—then however we get there, hallelujah! And if a popular song can take us to a similar place, I’m quite happy to call it art. Thanks for the rich smorgasbord of references. I will savour them, savouring the ones I know once again. As I too savour Sam Hamill, Mary Oliver, Wendell Berry, Ferlinghetti, Neruda, and so many others. They are a gift to us all. It’s been a rich discussion, thank you. As a Cascadian might say: (and I say this with no trace of irony): Namasté.